The Dog & Gun at The Dog and Gun01535 643159work Public HouseSurrounded by beautiful views The Dog & Gun nestles in the midst of Brontë land above the West Yorkshire village of Oxenhope. This 17th Century coaching inn has been run by Michael and Kath Roper since 1994 and their daughter Jodie now works alongside them. The recently extended dining room has spectacular views and has doubled the Dog & Gun's eating area making it ideal for small weddings, private parties and block bookings. Good home cooked food and excellent award winning beers bring people back time and time again and the new extensive wine list complements all of the excellent choices of food on the menu. Bar Snacks, special boards and a full à la carte menu are available 7 days a week, lunchtimes and evenings Monday to Friday and throughout the day every Saturday and Sunday. This traditional Yorkshire pub has a traditional Yorkshire bar with oak beams and two open fires giving character and warmth on a long winter evening or a chilly lunchtime. 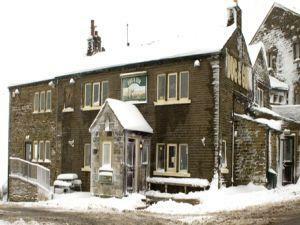 In a rural location outside Oxenhope, the Dog & Gun is close to the Brontë attractions of Haworth and the Keighley and Worth Valley Steam Railway which terminates in Oxenhope. Parking. Disabled access. Vegetarian options. Children welcome. Groups accepted. Surrounded by beautiful views The Dog & Gun nestles in the midst of Brontë land above the West Yorkshire village of Oxenhope. This 17th Century coaching inn has been run by Michael and Kath Roper since 1994 and their daughter Jodie now works alongside them. Open Monday - Friday 11.30 - 15.00 and 17.00 - midnight. Saturday 11.30 - midnight. Sunday 12noon - midnight.